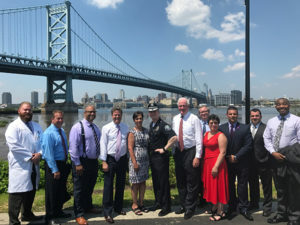 (Camden) Taking innovative steps to stem the tide of the heroin and opioid epidemic, Freeholder Director Louis Cappelli and the Camden County Addiction Awareness Task Force, are supporting the regional sharing of the prescription drug monitoring program by Congressmen Donald Norcross and Pat Meehan. According to the Center for Disease Control, three out of every four heroin users starts their battle by taking prescription drugs. Seventy-five percent of individuals battling their disease started on legal narcotics underscoring the need for this monitoring program.